What Monitoring Systems are Available for My Valve and Pump Heaters? Many engineers and property owners want assurance that the water systems inside their aluminum enclosures will not be subject to freezing. This is especially a concern for people in the northern US and throughout Canada, but is a necessary consideration for the majority of North America. For proper freeze protection, you should be using a heated enclosure that meets ASSE Standard 1060, class 1. This means the heated enclosure was built to maintain a temperature inside the enclosure of at least 40°F when the outside temperature is as low as negative 30°F. By choosing a class 1 enclosure, you'll know that your equipment is protected against freezing under normal operating conditions. However, what happens if the valve or pump heater fails? What happens if you lose power to the heater? Fortunately, there are multiple monitoring options to ensure the equipment inside the enclosure is staying at the correct temperature and no errors have occurred. The various monitors on the market include ones which provide a strobe light and audible alarm, and ones which alert the equipment owner via cell phone, email, or landline. Below is an overview and comparison of some of the options available. TAPF (Temperature Alarm Power Failure): Safe-T-Cover has an off-the-shelf system that will alarm you whenever the inside temperature drops below the set point. The set point is determined by you, the customer, and typically it is set at 38-40°F. It also alarms if there is a power failure on the electrical circuit that supplies the heater. The TAPF has both a visible strobe light alarm and an audible alarm. The TAPF monitor also has an extra set of contacts, so that an alarm signal can be run into a nearby control room. It also has a DC charger that will power the strobe and audible alarm in the event of a power failure. Typically this DC battery will power the alarms for 8-10 hours. Hubbell has alarm systems very similar to the Safe-T-Cover TAPF. The Hubbell alarms are triggered whenever there is a power failure and/or the inside temperature drops below the set point. Hubbell has a total of 5 different alarm options which feature either a strobe light alarm, an audible alarm, or both. Supco TA-2 alarm: AquaSHIELD resells a simple alarm system that they purchase through Supco. The Supco TA-2 alarm is an inexpensive audible alarm that was developed for refrigerator and freezer applications, but it is also suitable for the heated enclosure market. The Supco TA-2 alarm does not work in the event of a power failure because it does not have a DC battery to power the alarm in the event of a power failure. If you happen to have a power failure, unfortunately, you'll not be alerted that you have a problem. On Amazon you can learn more about the Supco TA-2 alarm. Sensaphone - call out alarms: The Sensaphone alarms will dial telephone numbers of the people (in the sequence you set-up) whenever the temperature drops below the set point you choose or if you have a power failure. Up to 8 people can be called in the event of an alarm condition. You can even tailor the exact telephone alarm messages and record these messages in your own voice. The Sensaphone models also include a backup battery in the event of a power failure. The information being monitored can also be accessed via a smartphone 24/7. 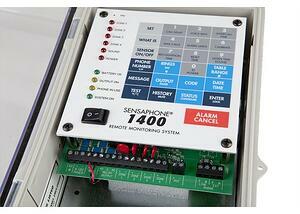 This remote monitoring is a unique feature of Sensaphone brand alarm monitoring systems. The Sensaphone model 1400 Monitoring System calls out through a regular telephone line and you can set up to four voice messages that will go out in case of a temperature drop. The Sensaphone Sentinal model uses a cellular modem and you can set up an unlimited number of email, text, and phone calls to go out in case of a problem. You'll want to use the cellular Sentinal model if your heated enclosure is in a remote location, where a telephone line is not available. There is an annual cellular fee associated with the Sentinal model. Part of keeping your equipment safe is having a plan set up in case the power fails or the interior temperature of your enclosure suddenly drops. These alarms will alert you in these cases and it is up to you to decide the best way for you to be notified. If there is someone on site at all times, a strobe and audible alarm may suffice. However, if your equipment is in a remote location or there are large gaps of time where there is no one on location, then one of the Sensaphone style models will work best for you. No matter what you choose as your alarm system, you'll also need to have a plan ready in case trouble does arise and you need an alternative source of heat. One possibility to consider is to have a 9,000 BTU portable propane heater on standby because it will more than replace the output of a 2,000 watt electric enclosure heater.